Following a short break, the gridiron buyback brand returns with 2018 Leaf Greatest Hits Football. Each box includes four previously-issued cards from a mix of brands and manufactures, and a new Leaf Valiant card. Last released as a 2016 edition, the 2018 Leaf Greatest Hits Football checklist promises top cards from NFL history. This includes vintage rookie and star cards, plus more recent hits via autographs and memorabilia cards. Graded versions are available, as well. 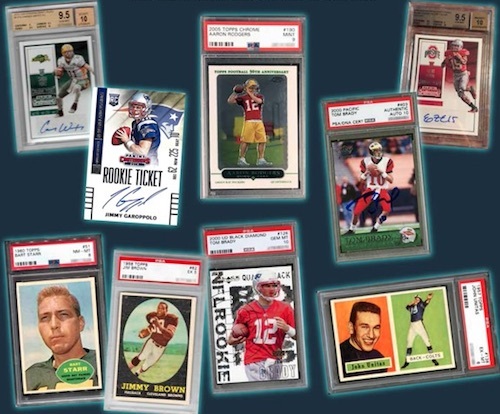 Tying in the popular Leaf football brand, the Valiant Greatest Hits Rookie cards feature likely 2018 NFL draftees using the familiar design. These come one per box. 2018 Leaf Greatest Hits Football only consists of 300 cases in the entire production run, which equals to just 600 boxes. 1986 Topps #161 Jerry Rice RC Rookie PSA 9 MINT SF 49ers Beautiful Card! 6 cards. Serial numbered #/60. PARALLEL CARDS: Orange #/35, Navy #/25, Purple #/15, Yellow #/10, Black #/5, Red 1/1, Plates 1/1.